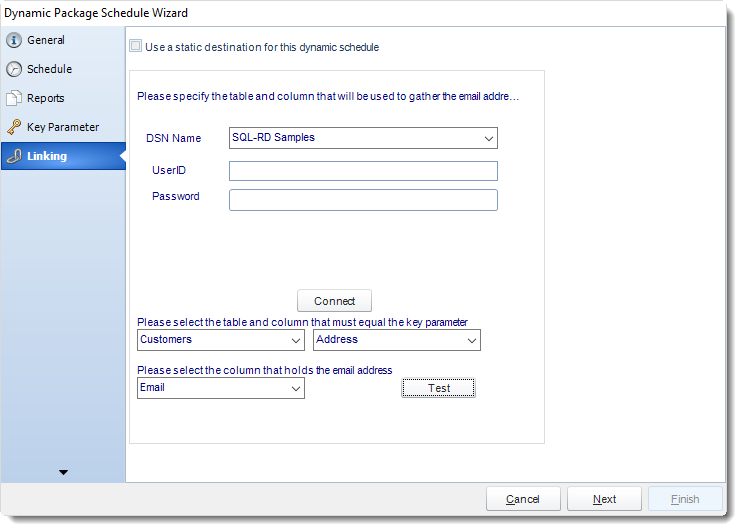 How do I setup a Dynamic Package Schedule for SSRS in SQL-RD? 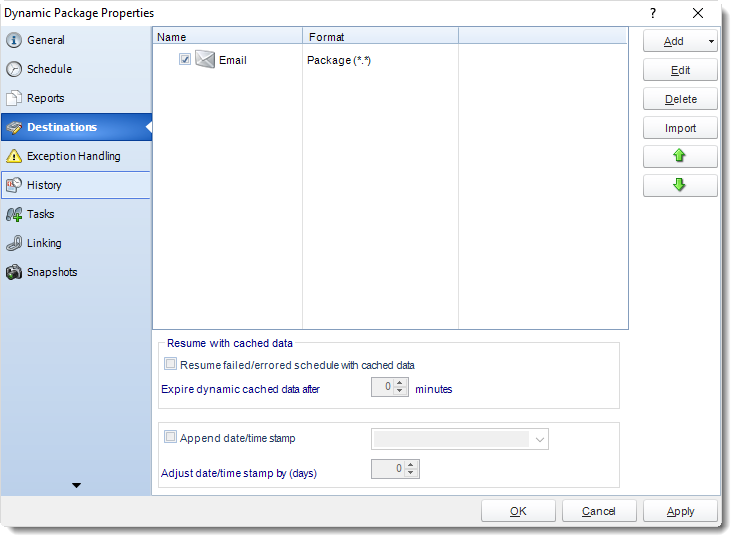 Dynamic Package Schedules allow you to create packages of at least two reports which share a common key parameter. 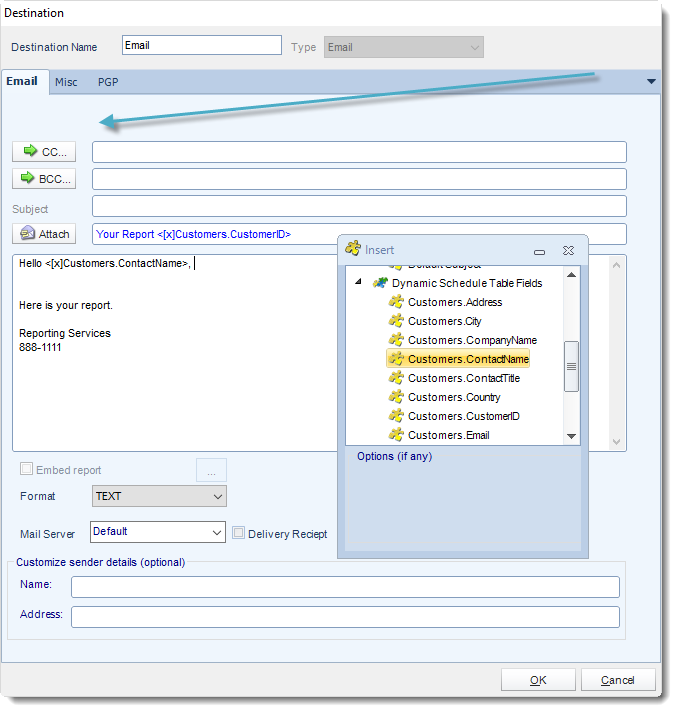 This allows you to create a package of reports to be delivered to a unique destination. Example: We will create a Dynamic Package to deliver the Marketing and Sales reports for clients and deliver this set to a unique destination. 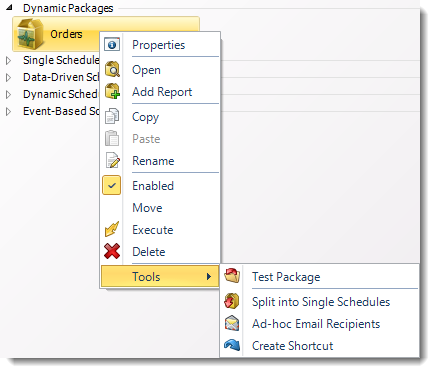 How to Create a Dynamic Package Report for SSRS? Package Name: The name of the package. Create In: The SQL-RD folder where the package is stored. Description: A short description to help other users identify exactly what this schedule is and what it is expected to do. Keyword: Enter some keywords which can be used later by Smart Folders to identify this schedule. Click Next to continue to the next wizard section. Daily: Run a report every day or at a frequency of days. Sub options: Repeat every X Days. Example: Run the schedule every 3 days. Weekly: Run a report on a weekly time frame. Sub options: Repeat every X weeks. Example: Run the schedule every 2 Weeks. On: Select the specific days of the week the schedule will run. If only once a week,select only the day of the week it will run. Example: Run every Monday, Wednesday, and Friday. Week Days: Run the schedule Monday through Friday. Working Day: Run the schedule starting on a specific day of the month. Indicate which day of the month the schedule will run. E.G. run the schedule on the 4th working day of the month. Monthly: Run the schedule on a monthly time frame. Use the following options: Checking this box will enable you to select frequency options such as the “last Thursday of the month.” Also you can include or exclude specific months from the schedule. Annual: Run the schedule every year at a specified time. Custom Calendar: Select the custom Calendar you wish to use. You can create a new custom calendar from the menu as well. Please see Custom Calendars for more information. Run Schedule every X Minutes, hours, days, weeks, months, years. None: No scheduling is required for this item. Destination: Select how you would like your report to be delivered. This will also determine some of the options that will show up later in the process. For example, if you select email, you will be asked for email address later. Start Date: Enter the desired starting date for the schedule. This section can be the current date (providing schedule time has not already passed) or a date in the future. End Date: If the schedule is due to end after a certain date enter that here. If the schedule is to run indefinitely, then leave it blank. Schedule time: On the Next Run date, the package will run at this time. 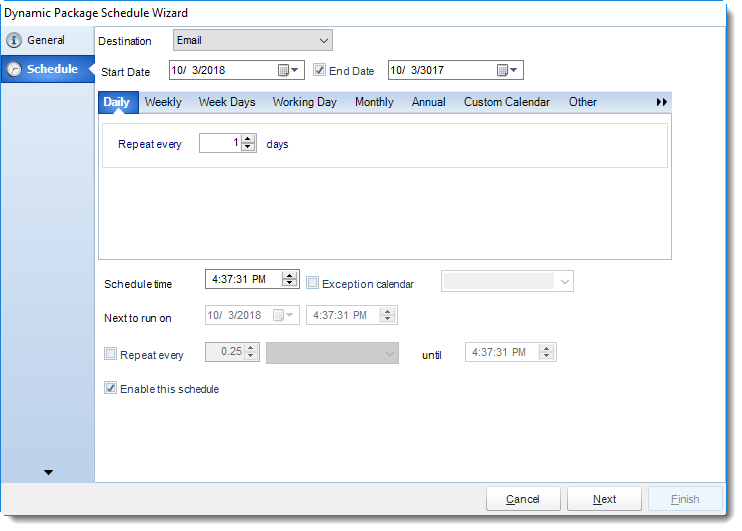 Exception Calendar: Choose a calendar that will instruct the schedule to NOT run on those specified days. Please see Custom Calendars for more information. Next to run on: The package will next run on this date. Repeat Every: Rerun the package every x minutes from the scheduled time until your specified time. For example, you can set up a daily package to run every day at 8 am, and to run every hour until 5 pm. Until: After this date, there will be no automated scheduling of this package. Enable this Schedule: Uncheck this option to Disable the package. Disabled packages are not deleted, but they do not execute automatically. You can re-start the automatic scheduling at a later date by checking this option again. Or right-clicking this schedule from the main screen and selecting Enable. A Dynamic package may be created with no constituent reports and then the reports can be added later. However, you may also add reports at this stage in the wizard - and amend, delete or add some more later. Merge all PDF Files: Merge PDF outputs into a single PDF file. 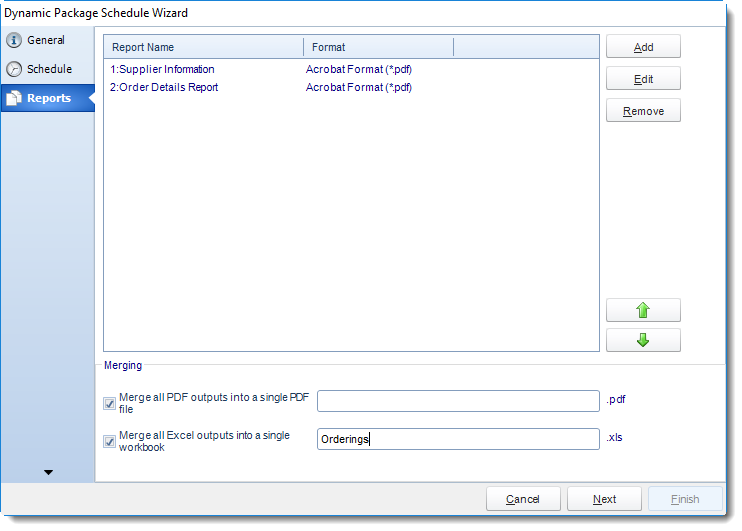 The reports will appear in the merged PDF in the order they are displayed in the package schedule. Checking this box will bring up additional PDF Options. Merge all Excel Files: SQL-RD will then merge all excel outputs in the package into a single excel file. 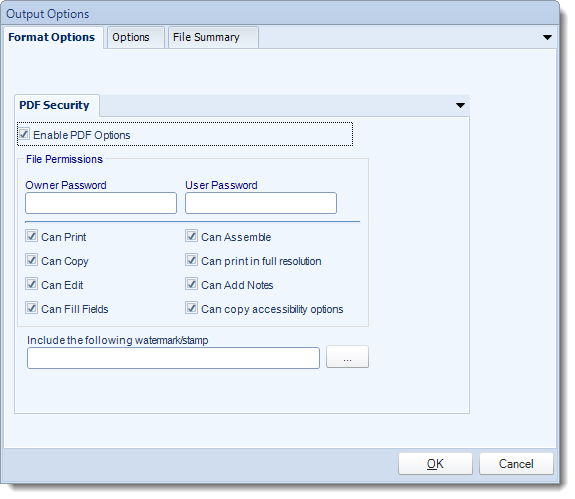 HINT: Add Password Protection to this section in this option window rather than the individual report in the package. This will password protect the entire merged workbook. Package Report Properties will appear. 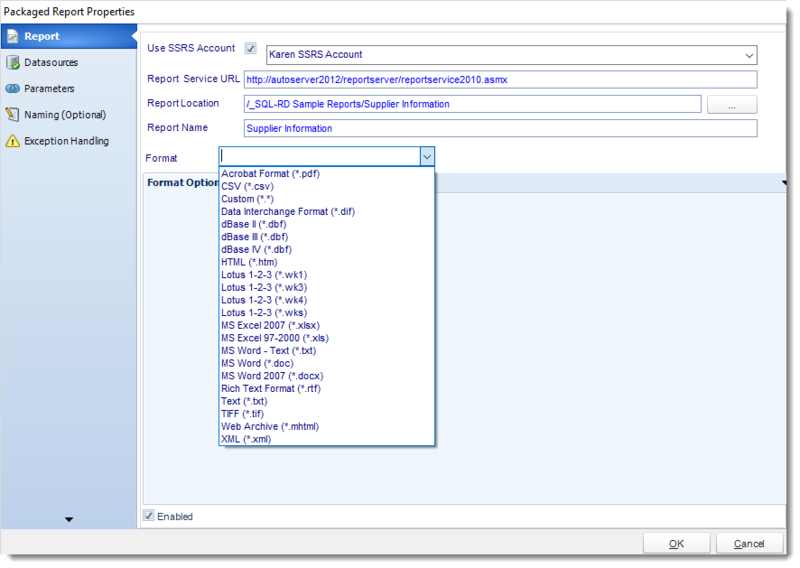 Use SSRS Account: Select the SSRS Account where your report server is located, or create one by clicking on (...) button next in Report Location. 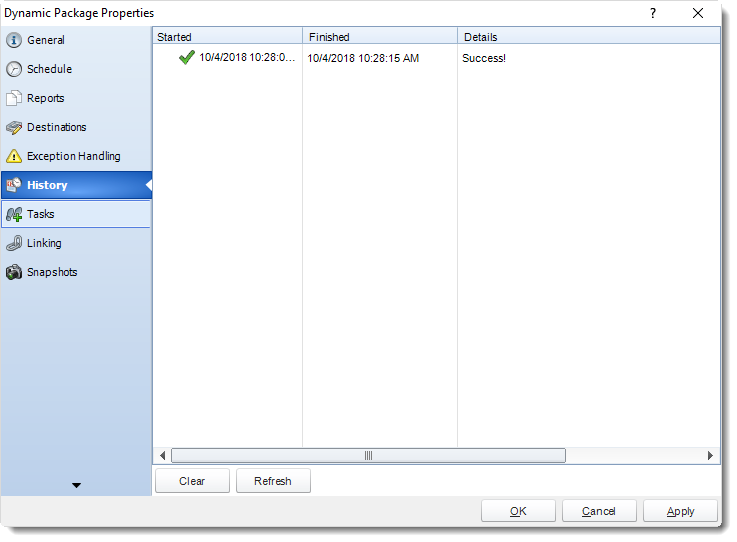 Hint: SQL Azure Reporting Services- when writing your report, make sure you have enabled Forms Authentication. You should use the 2010 .asmx address for your reporting service URL. Select the SSRS Account or create one by writing the name into the combo box. 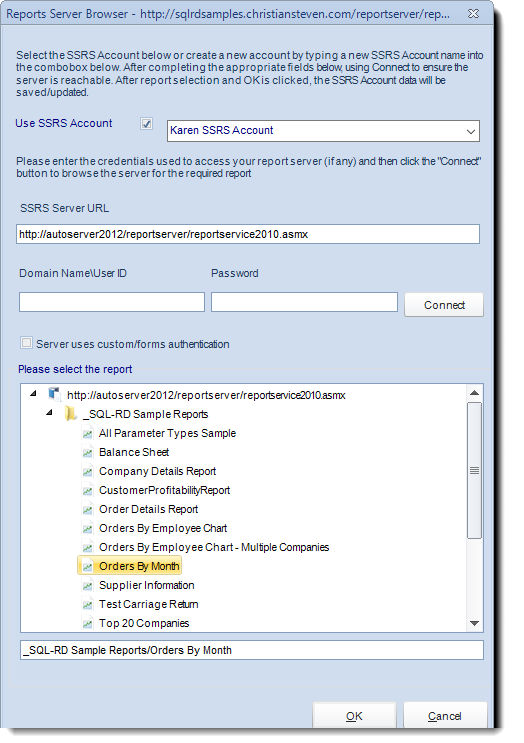 SSRS Server URL: Enter the address of your reporting services server and click Connect. 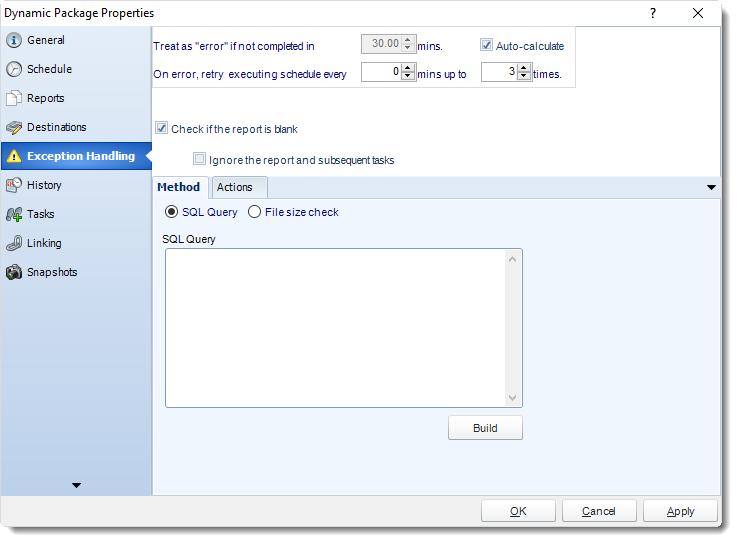 Select the report and click OK.
SSRS Account is now added in SQL-RD. Report Service URL: Enter the address of your reporting services server. Report Location: Browse through the report server browser to select the desired report. Authenticate to the reports server if necessary. Report Name: Write in the name of the package. 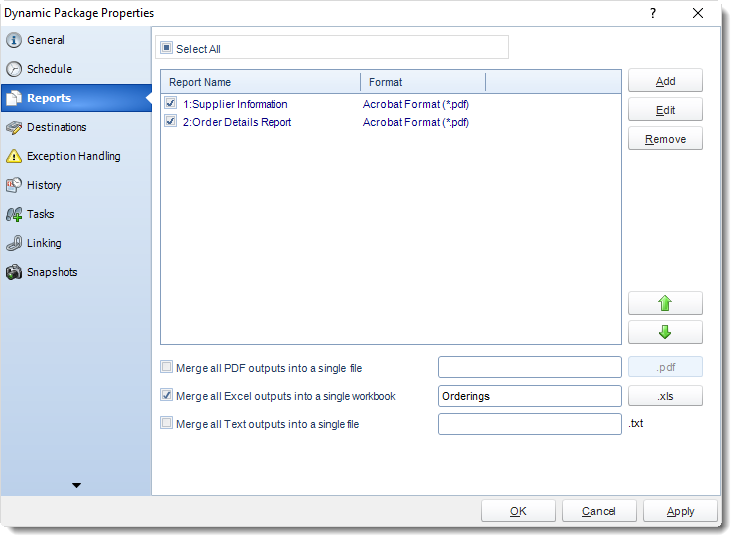 Format: Select the output format for the report. In this section you will authenticate to the database the report runs against, set snapshots, and other options. Login Required: Set the authentication information for the report. Preview: View the report prior to execution. In this section, you will determine the parameters for your report (if any). If your report has no parameters, you may skip this section by clicking next. The parameter must be in use in the report. The parameter must be visible. The parameter must be set to be prompted at run time. If these three requirements are achieved, you should see the parameters in your report listed in this screen. For each parameter, select from the drop down list the value the report must use. You can type a value into the field as well. 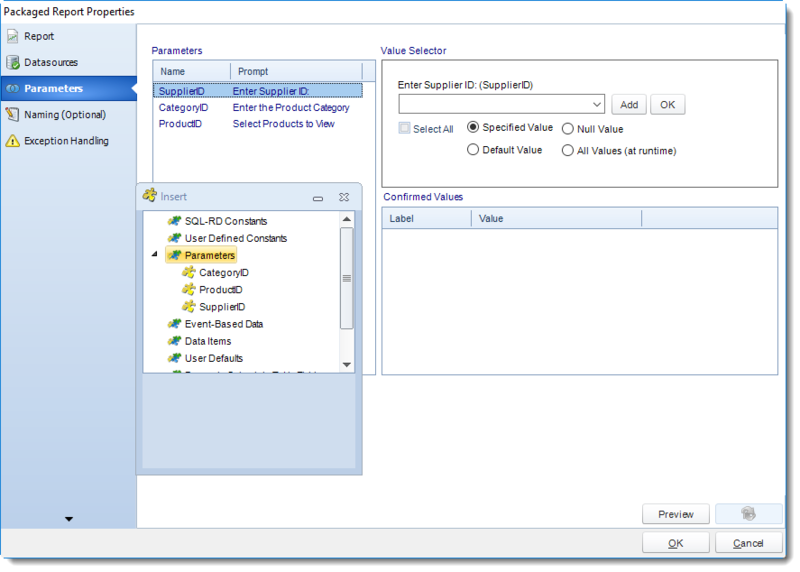 SQL-RD can handle SSRS Reports with Cascading parameters, or reports where you can select multiple parameter values. Select All: Selecting All Available Values will run the report given all the values. Specified Value: Select the value you want in your report. Null Value: Set no value for this parameter. Default Value: It will select the default value. All Values (at run time): Any new values will automatically will be included at run time. Check if the Report is Blank: If a report is blank because it genuinely returned no data, recipients can misconstrue this as an error with the scheduler. 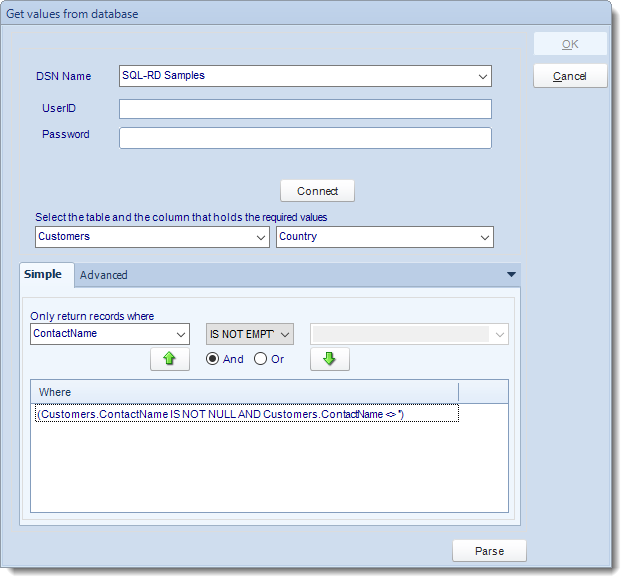 This option allows you to identify genuine empty reports and instruct SQL-RD on what to do with them. Ignore the report and subsequent tasks: if the report is blank, do not send the report. The report will not be delivered to the destination. No custom tasks will be run. 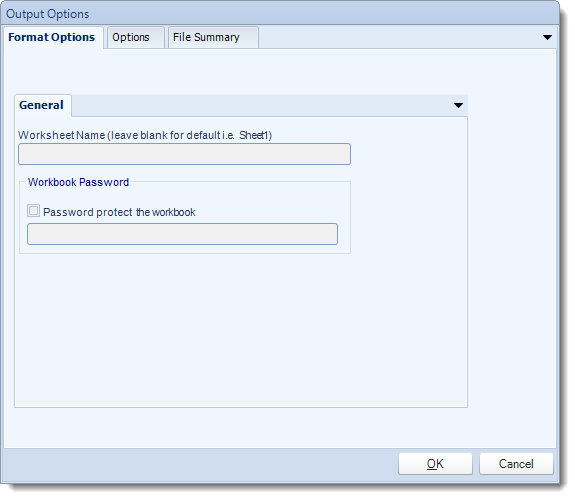 Select the Method that will determine whether a report is blank. 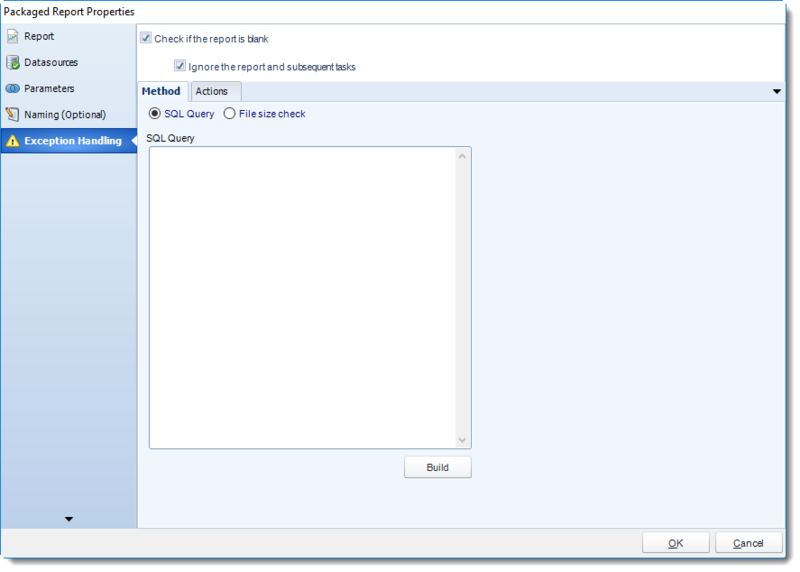 SQL Query: Select this option to use a user made query that will determine if the report is blank. If the query returns no results, the report is blank. Get values from a database window will appear. For more information about Get values from database, click here. File size check: Assume reports is blank if size is under "X" bytes. Select an action from the task list. This task will be executed in the event that a schedule is blank. For more information about tasks, click here. Tip: You can send a notification if a report is considered blank instead of sending the report. Simply select “check if a report is blank” then select “Ignore the report.” In the actions tab, select “Send Email” from the list. Compose your email and save. In this section, you will determine the parameters for your report. On the Key Parameter tab, you will begin by selecting the report parameter that will hold the unique value being “looked up” by your database. 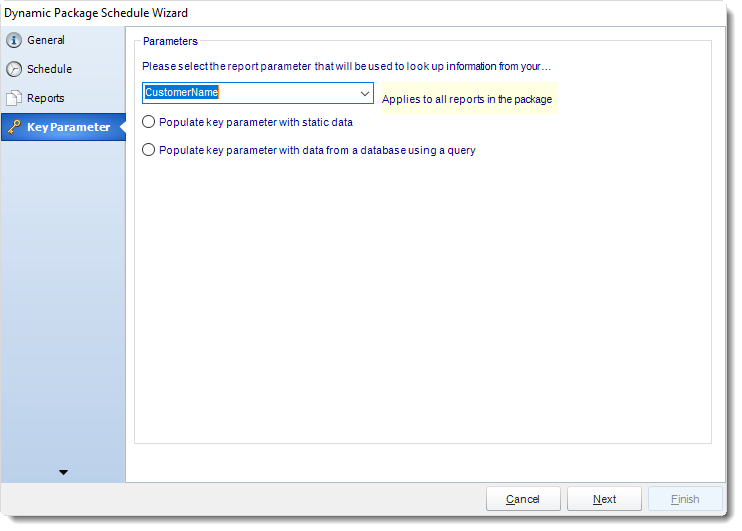 Populate the key parameter with static data: This option would be chosen if you DO NOT want SQL-RD to feed multiple parameters in to the report via database. Rather than dynamically populating the key parameter, all reports in the package will run for a specific parameter. 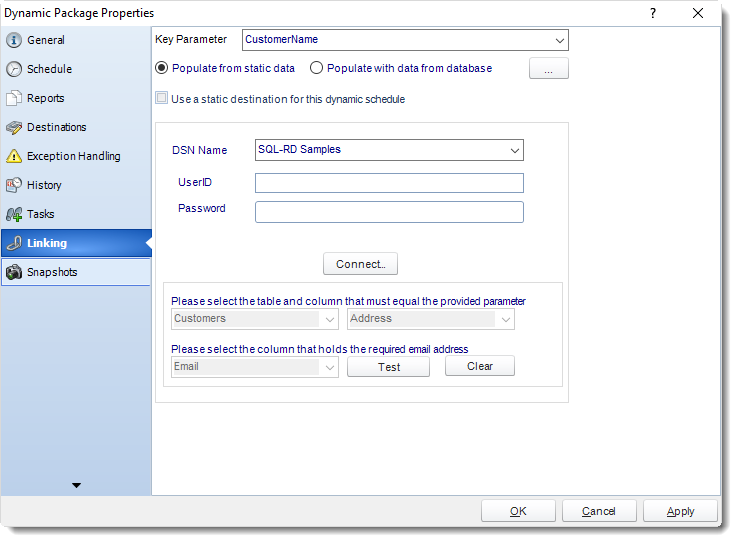 Populate key parameter with data from a database: This is the most common option for users creating dynamic schedules. 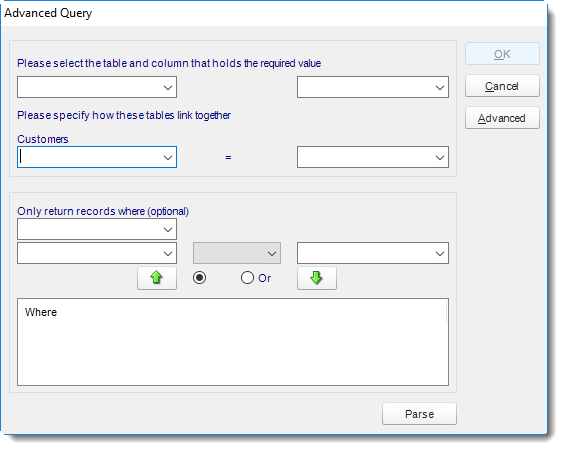 SQL-RD will use a query to automatically feed key parameter values into your report based on a table. Get values from database will appear. DSN Name: Drop down and select a DSN. We strongly recommend System DSNs so that the DSN is visible to SQL-RD even when the user associated with the DSN is logged off. All communication to databases (including Access databases) is done through ODBC, so you must setup a system DSN to the database before you can use this facility. When setting up DSNs we recommend (if possible) that you use Windows Authentication (Trusted Connection). This ensures that your username and password are not required to be stored in SQL-RD (more secure) and overcomes a large number of security restrictions which Windows places on DSNs. 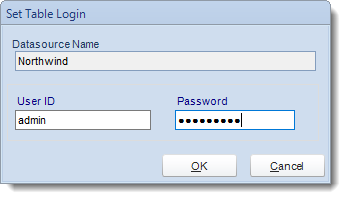 When using Windows Authentication, make sure that the SQL-RD NT service user (or background application service user) has full rights to the database otherwise, though you will connect when you are logged in, automated scheduling will fail if the Service user has not got rights to the database. 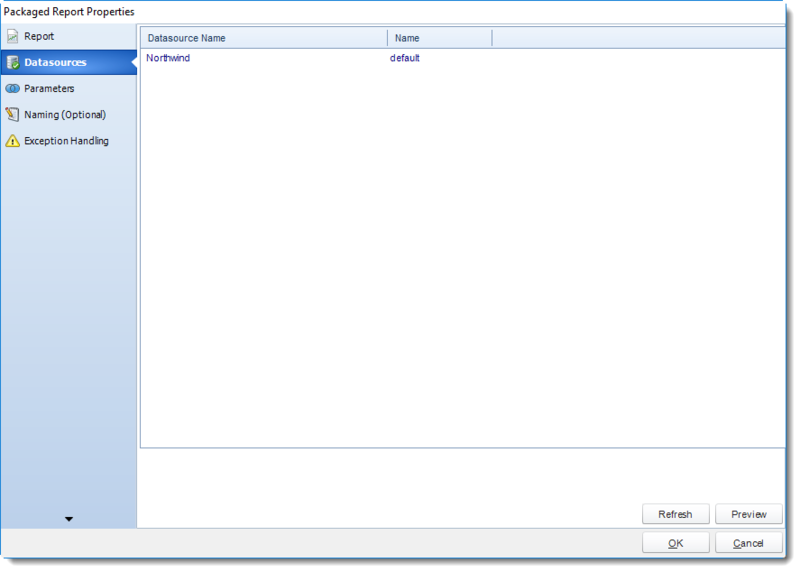 When setting up a DSN to a SQL server, you must ensure that the "Default Database" setting is set to the database you are connecting to (Windows defaults this to "Master"). Password: Enter the password associated with the above user. Connect: Connect to the Database. Notice that the field in the report and the column in the database can be different. Either way, the parameter values must match the values in your report. In this section, a connection between your key parameter values and their corresponding destinations must be established. 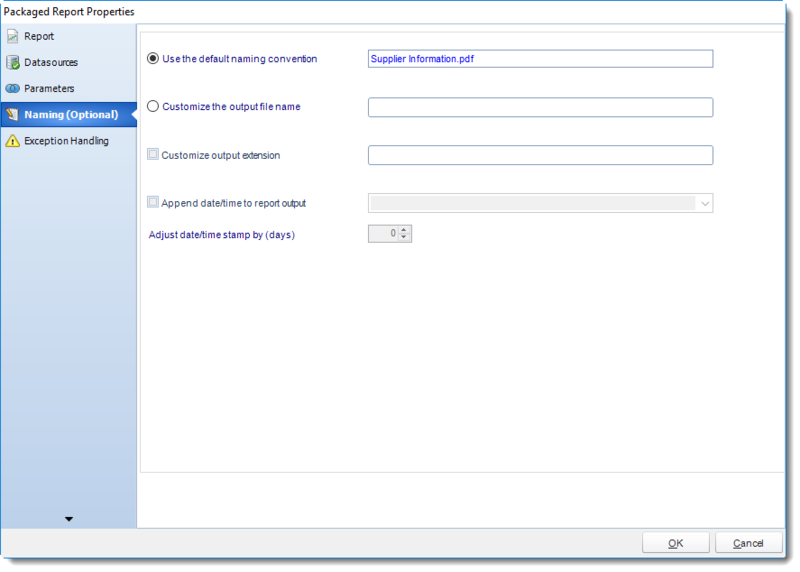 Use A static destination for this dynamic schedule: Rather than looking up a corresponding destination for reach report output, send all generated reports to a single email address, folder, SharePoint etc. Select the table name and the column in that table which matches the parameter value which you determined in the previous step. 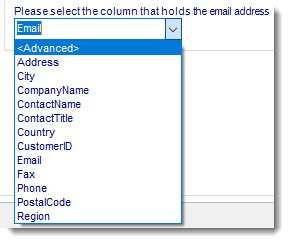 Select the column in the table that holds the email address (or folder path or printer name) that corresponds to the above parameter value. To achieve the above advanced functions, select Advanced from the dropdown list shown below. This functionality is for advanced users only. The screen is structured in a standard format which will be familiar to database programmers and people who are familiar with SQL or boolean statements. For more information on how to write SQL statements, please see your database administrator. 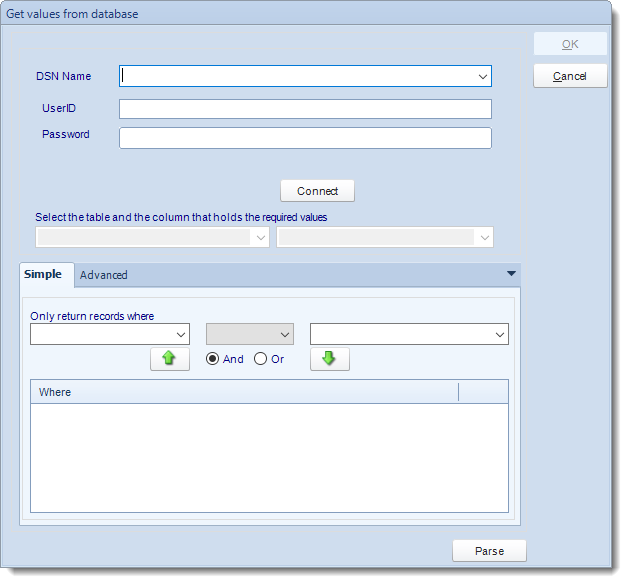 You can build your database query visually using the form provided, as shown above. If you are fluent in SQL, you may wish to enter your SQL statement manually. Click to see the advanced interface. Here we can add the extra limiting criteria. You can type directly in the "Edit Query" box and enter the SQL statement. Under the Destinations tab, the destination that you chose previously under the Schedule section will now automatically pop-up. Secondly there is no ‘To’ address because this information is being retrieved from a database. The reason for this is that since the destination type was defined in the previous step. Use the Inserts Function to customize the email subject and body as desired. Simply drag and drop Dynamic Table Fields from your Inserts list. Select the format for your report. 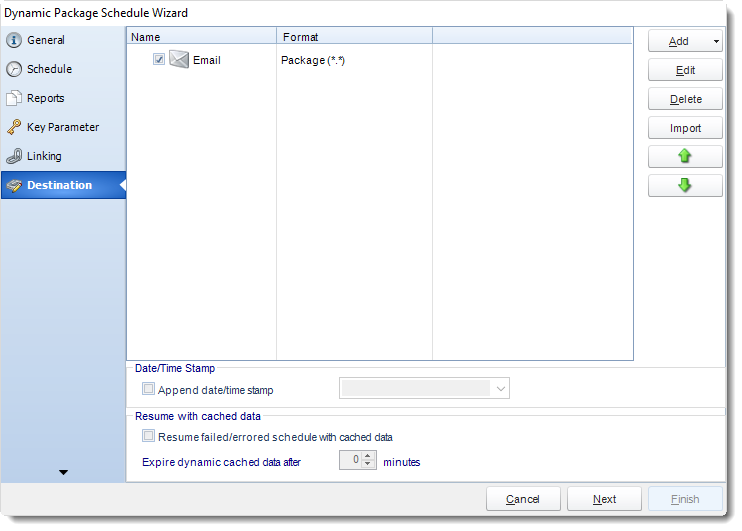 Resume with Cached Data: Enabling this option instructs SQL-RD to resume any failed schedule run where it left off using the cached data instead of starting the schedule from the beginning. Treat as “error” if not completed in X minutes: If a report takes longer than the specified amount of time to run, this option will treat the schedule as an error and follow the appropriate action. 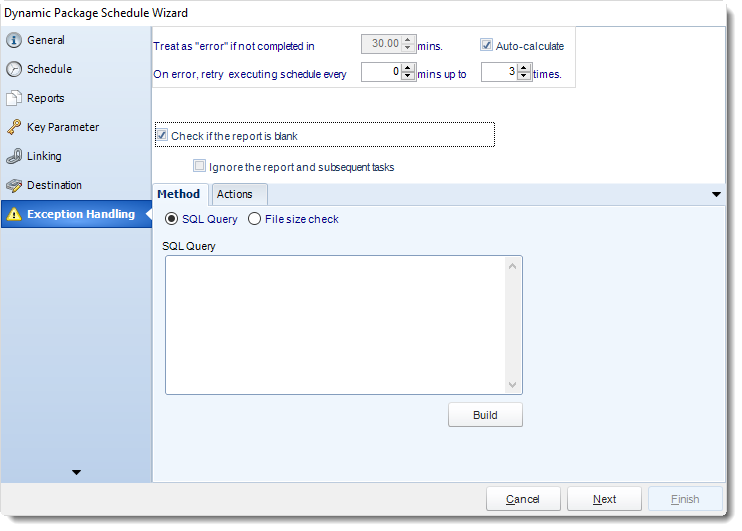 The “Auto-calculate” option instructs SQL-RD automatically determine how long a schedule should take to run the report. If it takes longer than the calculated amount of time, then it is an error. If manually determining the error timing, please double check the run time of the report in order to get the correct time estimate. On error, retry executing schedule every: If set to 0, SQL-RD will deem the schedule as "Failed" the first time it encounters an error. The schedule will not run again until its next scheduled time. Change the value to tell SQL-RD how many times you want it to retry running the report before declaring it as "Failed." In the section you have the option of setting up custom tasks. Custom tasks are business process automation tools that can be auto triggered before or after a report runs. For more information on Custom Tasks, click here. 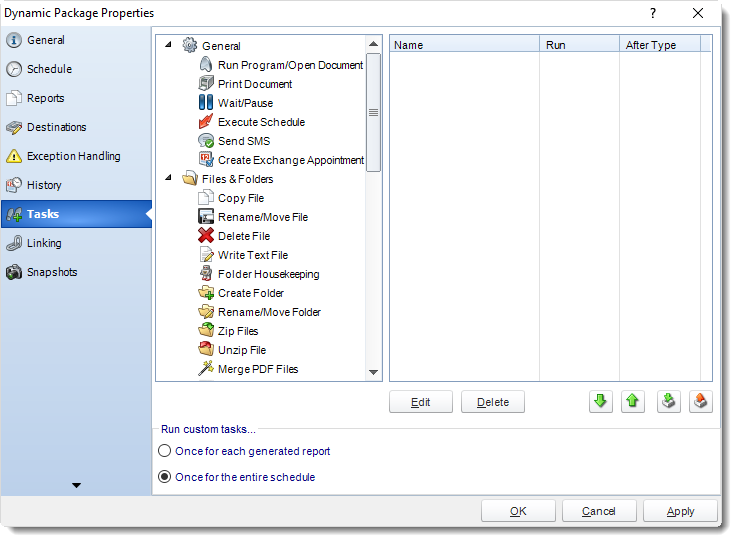 Once for each generated report: Each task will be ran for each successfully generated report within the schedule. Once for the entire schedule: Each task will be ran once when the schedule has completed successfully. If you have no desire to add a Custom Task, you can click finish to complete the schedule. Properties: Edit the schedule from here. Or you can just double click on the schedule. Open: This will open the package and show its constituent reports. You can right-click on each of the constituent reports to see the context-sensitive menu shown in the picture above. Enabled: Use this to enable or disable the constituent report. Refresh: Pulls through changes to just that report which were made outside SQL-RD. Rename: Renames the selected report. Preview: Generates a preview of the selected report. Delete: Deletes the selected report from package. 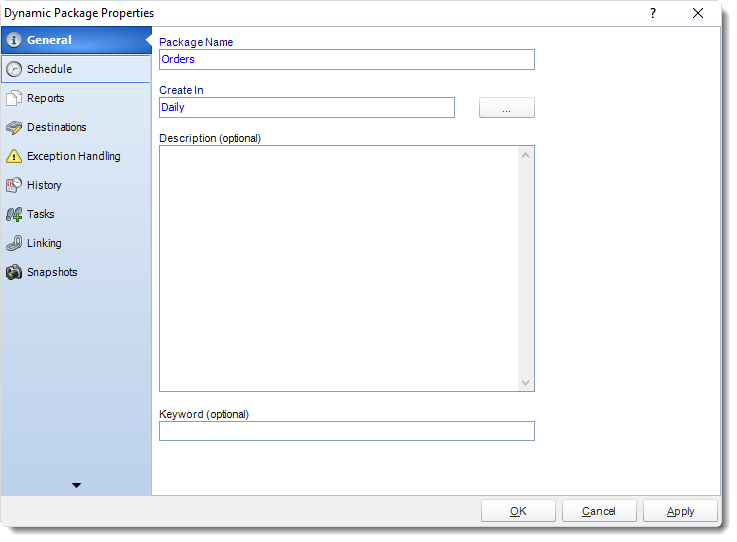 Properties: Displays the configuration properties of just that report. Add Report: Use this to add one or more reports to an existing package. Copy: Use this to copy the schedule. Right-click in the "white space" of the folder you wish to copy it to and select Paste button. 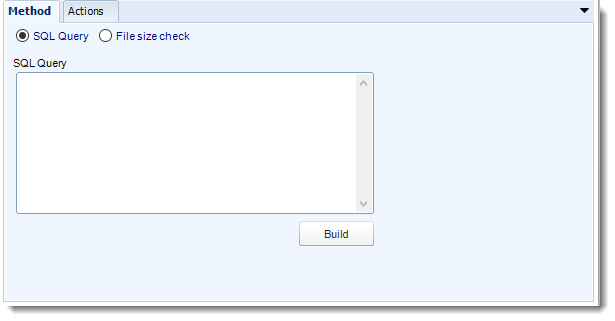 Enabled: Schedules are enabled when there is a check icon beside this option. To stop a schedule from running, or to "pause" it for a while, select this option to remove the check icon. Disabled schedules will not run until they are enabled again. 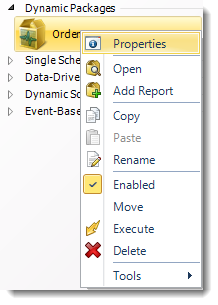 Move: Use this option to move the report into an existing package. Execute: This button will execute the schedule immediately. Note that the next run date and time is not moved on as a result of a manual execution. They only move on if the schedule is run automatically by one of the schedulers . Delete: Selecting this option will delete the schedule. 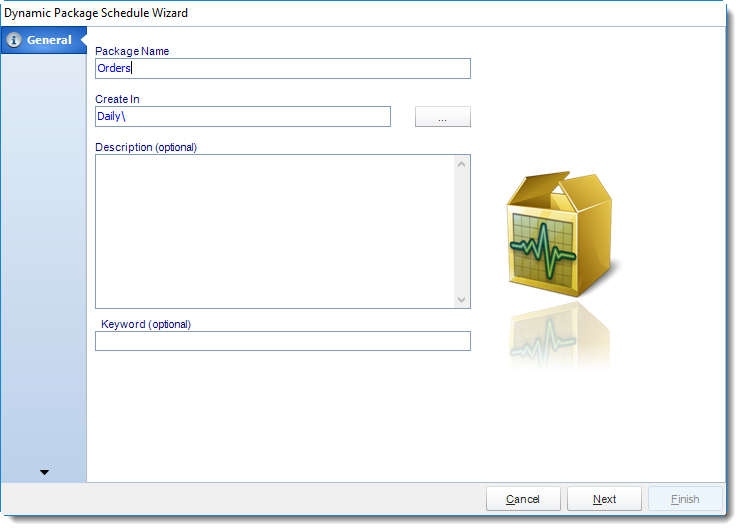 Test Package: Use this option to test the schedule and export it to selected "test" destinations. Split into Single Schedules: This will split all the constituent reports in the package into Single Report Schedules. This process will automatically delete the package once the splitting process is completed. Ad-Hoc Email to Recipients: Select this option to send an ad-hoc email to all recipients of this package. You can use this to alert recipients to a planned system outage, or any other useful information. Create Shortcut: Use this option to create a shortcut you can save in any location on your PC. Execute the shortcut to execute the schedule in SQL-RD. 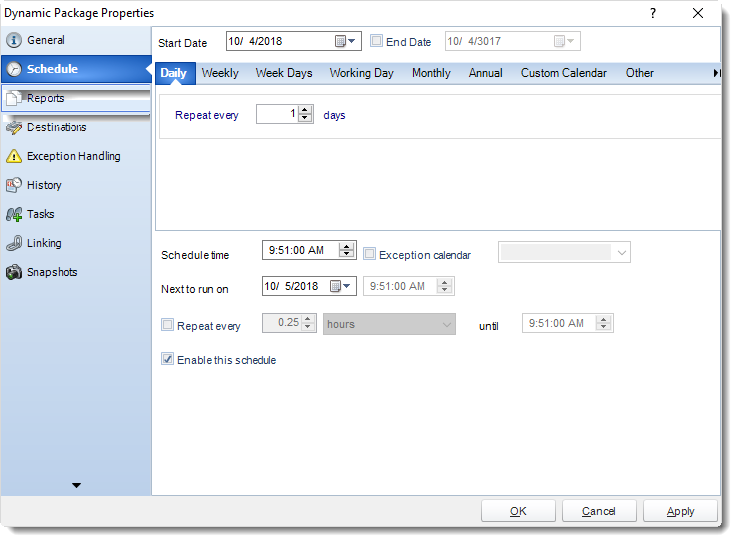 To access your schedule properties, right click on a schedule and select properties. 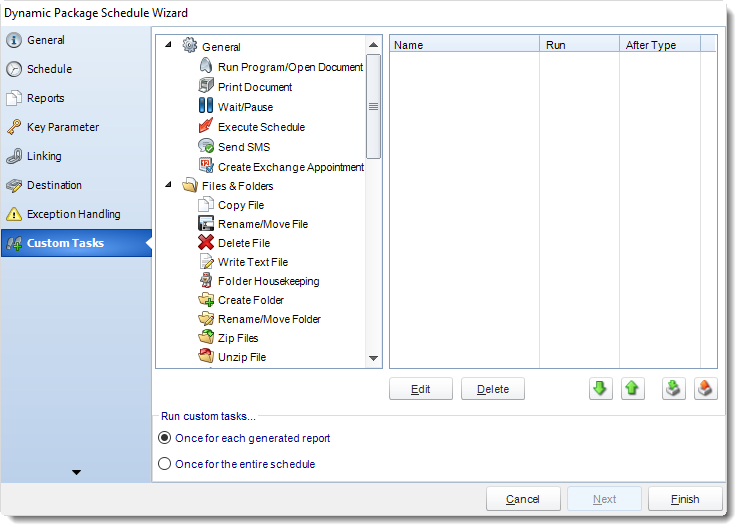 Similar to the schedule wizard, you adjust settings to your schedule such as timing, error handling, or custom tasks. History: Review the schedules history. Successes, failures, and other data is located here. 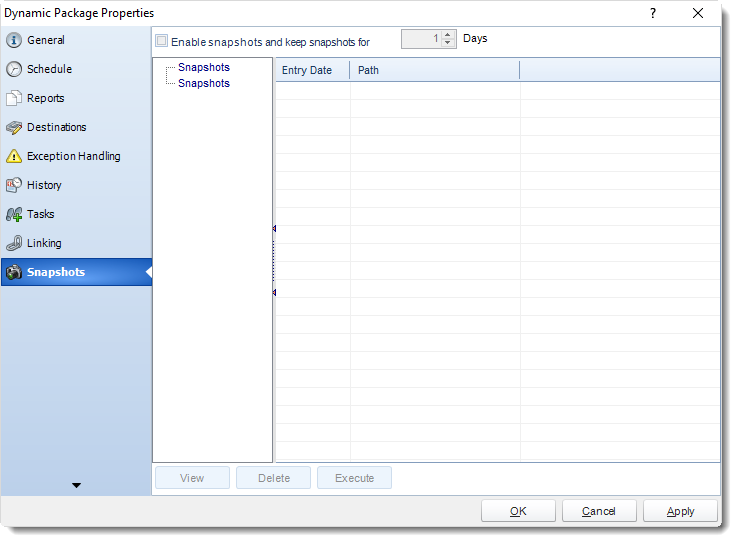 Snapshots: A snapshot is a copy of each report a schedule or a package generates. Keeping snapshots enables you to resend past reports without generating them afresh - especially if the data has changed in the meantime. Simply select the number of days to keep the snapshots.